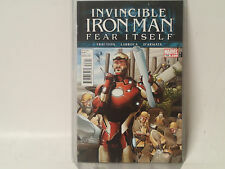 INVINCIBLE IRON MAN 506 ...VF/VF+.....2011...Matt Fraction...Bargain! INVINCIBLE IRON MAN #9 MARVEL 2016 1ST Print RIRI WILLIAMS IRONHEART VF- Nice! This page was last updated: 24-Apr 21:47. Number of bids and bid amounts may be slightly out of date. See each listing for international shipping options and costs.